I am not very excited about these results. I'm not sure what was keeping me from a faster pace. I suspect it was the memory of last year's 100 degree race day and the closest I ever came to vomiting during a run. Other than that, I have no excuse. I felt good and even sprinted at the end. That almost never happens to me in a race. I've usually spent it all before I come close to the finish! I will have a chance at redemption in a few weeks. The HOF 5 mile race is on the 28th I'll be ready! On another note, I got an email today reminding me that the inaugural Cleveland Rock and Roll Half Marathon is just 13 weeks away! 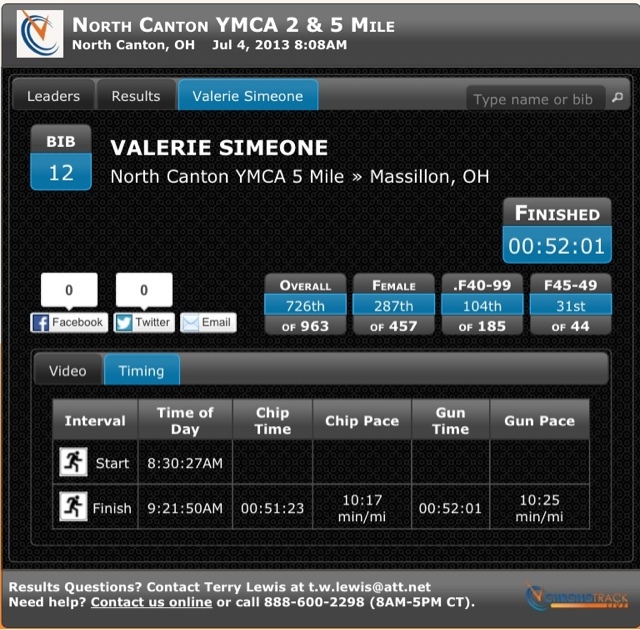 I am scheduled for the Canton Half Marathon on September 8th but it has been a fiasco since it was announced. I have my doubts as to if it will even take place. This week is back to relative normal. I hope I get a little higher mileage in during this week. I hope your workout and life plans come together for you this week as well!